See the poor sad printer edging it's way off the desk? We gave the corner dresser thing to Goodwill and put the hutch on top of the fabric dresser on the other side of the room. LOVE!! I have so much space now. It's blissful! Plus the tabletop only cost about $50 plus $15 in paint. 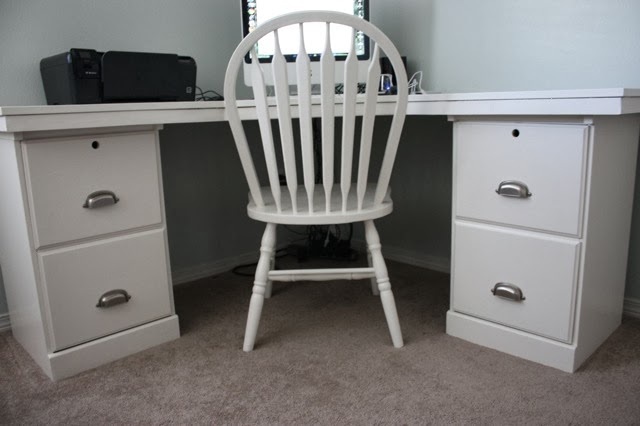 I repainted this room Sherwin Williams Sea salt and the desk, chair and cabinets got a few coats of Sherwin Williams Dover white in satin using kitchen/bath enamel paint from Lowe's. The underside of the desk top in progress. We used a sheet of MDF and some furring strips (that are only like $1 each) Then a piece of the same thin molding that we used when building the mirror a few weeks ago. We just glued that to the edge of the MDF to give it a more finished look. This is how the filing cabinet started out. I painted it white months ago but then repainted it the Dover white so it would perfectly match the desk top. The Ana-White plans called for a different table leg but since we already had that one we made it work. My husband also drilled a big hole in the back corner for the cords to go through. Close up of edge showing thin molding. After it was all finished it didn't look as "finished" as I wanted. I didn't like that you could see the wood on the underside so we cut up two pieces of cheap furring strip 1x2's and used that as molding on the front. It added just the perfect finishing touch! LOVE IT!! I feel like I have tons of room and there is lots of room on the underside for the trash can and a place to hide the shredder.